Below are testimonials sent in to us from our satisfied customers. Please submit your testimonial with a picture of your best friend(s) and we'll place it up here. You will earn a one-time reward of 100 points that will be added to your account when the picture/testimonial is placed on the website. Once you are logged in please go to your account page to submit a testimonial. I have utilized another raw food supplier that is closer to me (in my own state) and while they are great I choose to use Hare-Today over them. Hare-Today has a huge variety of proteins and multiple different forms of it such as cubes/chunks/organs and also grinds. I like to have both chunks and grinds for my dogs. Because they have everything I need I only have to order from one place and don’t have to worry about ordering from multiple suppliers, this makes it super easy on me. 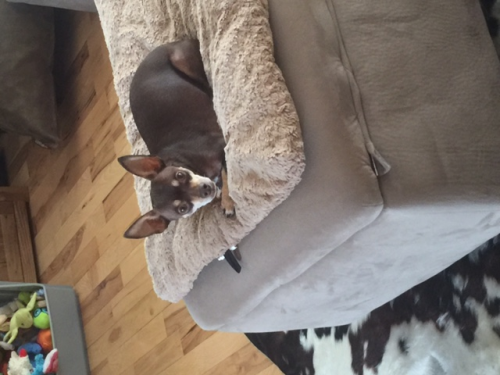 I have 6 dogs from 4 pounds to 25 pounds and have been on raw for 11 months now. 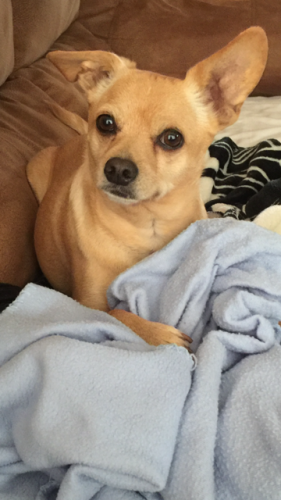 Even small chihuahuas like to rip/chew/shred meat like the big dogs do. I find the grinds work well with the new puppy until he gets better at chewing up the bigger pieces. I have ordered multiple proteins and items from here and my dogs have not turned their head at any of them, they love it and eat up everything. I get great compliments from the vet on how well my dogs fur/body condition look and since utilizing Hare-Today food the last few months I have noticed even more of an improvement. Hare-Today has amazing customer service and an outstanding website that is easy to navigate. You can tell a lot of hard work and time goes into this business and it shows through on everything. 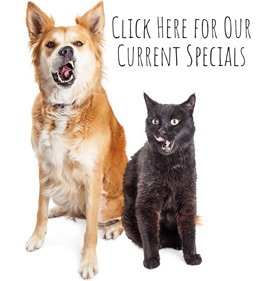 They work hard so you can give your dog the best and have many many years with your furry kids. The whole entire process is smooth and easy, simply order and then get your dogs food on your door step; they make it extremely easy for pet-parents. The products are packaged very nicely, professionally and come to me looking great. I feel 100% comfortable and confidant in feeding my dogs Hare-Today’s products and can trust I’m getting quality food for my dogs. I re-homed a pair of 5-year old male ragdoll cats (due to an impending divorce). One cat was super friendly -- and super fat! -- while the other cat was very aloof and I noticed he would pull out chunks of his stringy yellowed 'limp' fur. Both cats had been free-fed (always available) very cheap dry kibble and had ballooned to 20 and 26 lbs! I brought them home and immediately set fixed meal times and slowly cut their kibble and began mixing it with better quality dry food; however the white cat still pulled out his fur. 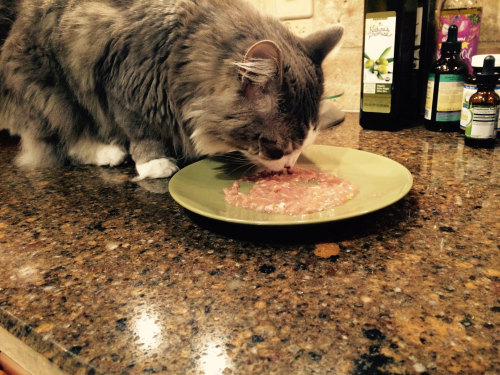 Once the cats acclimated and began slimming, I tried them on raw food. Surprisingly the fattest cat ('keg on legs') didn't want any part of it but the sickly cat went face-down in raw rabbit! Yay! Not long after, I noticed his fur lost it's mangy yellow color/texture and his eyes were much brighter. 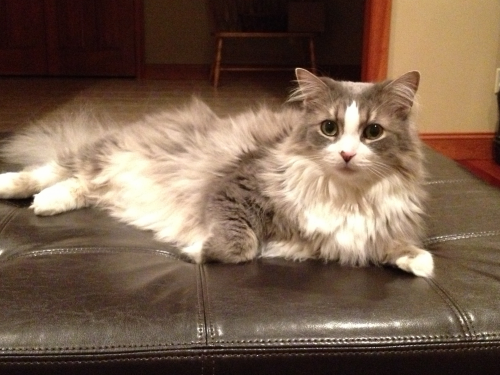 Then his fur started really fluffing out. And his personality changed as well. I also noticed fresher breath. The other thing I tend to forget is that this cat's poop smell would peel paint off the walls! OMG!! Raw feeding changed the odor to 'normal'. The boys have been with me for 5 years now and are much more healthy in weight as well as delightful company. I believe the problem cat had allergies and/or intestinal issues which kept him from digesting crap quality dry food. Both get a mix of quality kibble, and the problem guy really really loves raw food -- rabbit,was the easiest 'sell' but now he eats some beef and pork too. 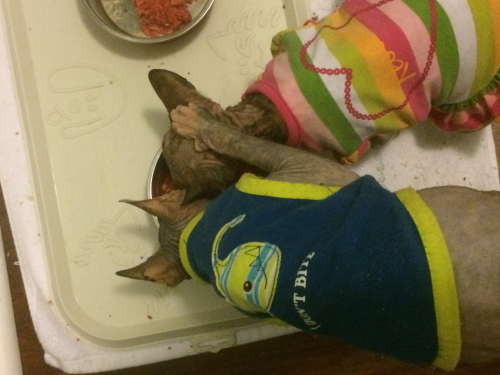 Although one cat doesn't much care for raw food (I keep offering), my other critters have really blossomed from eating it and are *very* healthy -- vet visits are few, teeth are good. I think it pays for itself in vet bills. I've been a customer of Tracy's for many (10?) years will continue being a customer. I've recommended her to several people. And thanks to Tracy for supplying high quality and high variety raw food! 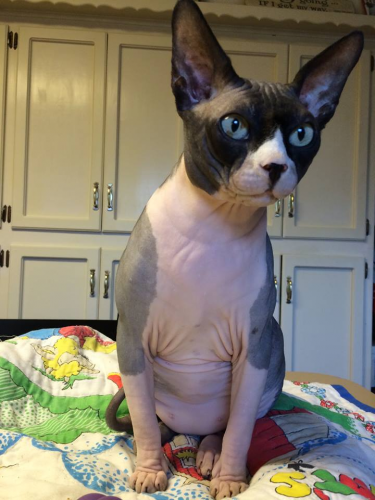 Or says my beautiful sphynx girl, Mildred Louise. I've been ordering from Hare Today for a couple of years now, and have never once had a bad experience. 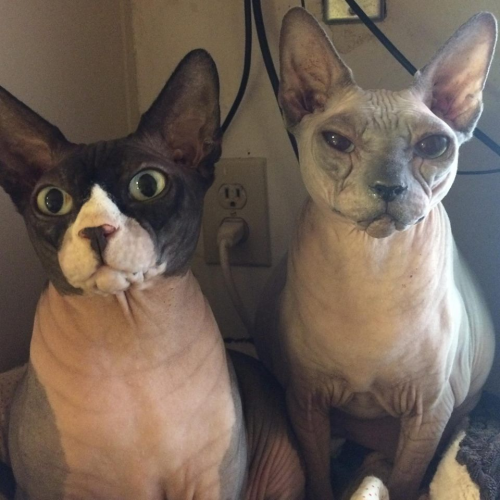 I have 2 sphynx (Fumble McFly and Mildred Louise) that love their raw, their personal favorites are the sheep, goat and pork. This is my Bani, sitting in her Hare-Today box. 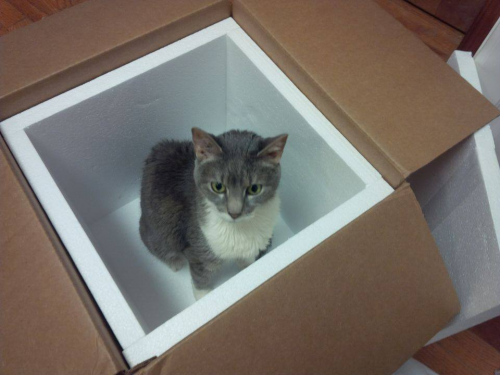 One of the many benefits she received from her Hare-Today diet was a new box with every shipment. 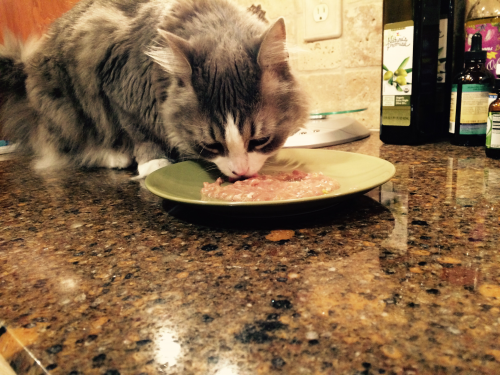 She had cancer, and it made it hard for her to digest her food and absorb the nutrients. But once we found Hare-Today and started her on raw food she had a much better quality of life, and was able to enjoy eating and feeling like a regular cat until just a week or so before she passed away. Thank you for helping us make the most of the time she had left. 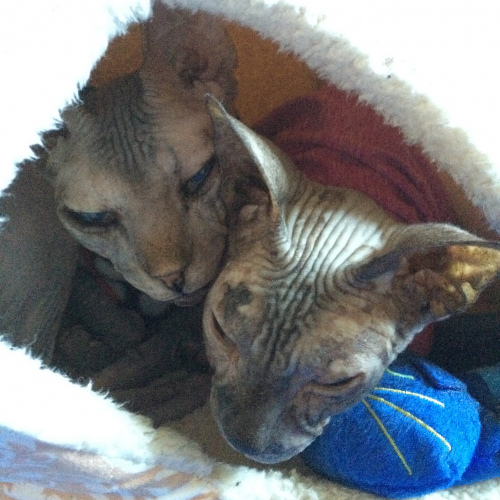 I started fostering two senior Sphynxes in September, who I affectionately refer to as "the grannies." 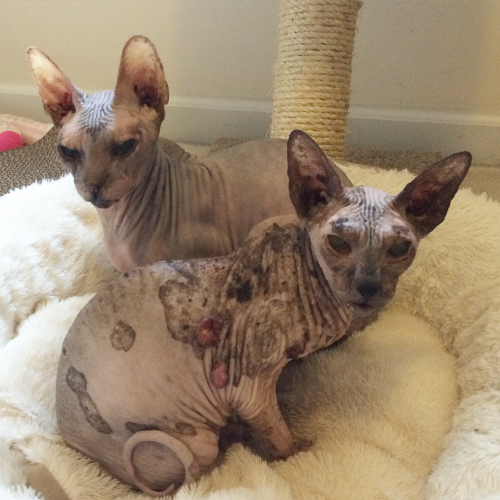 When Cleo and Lottie came to me, they were in very rough shape. 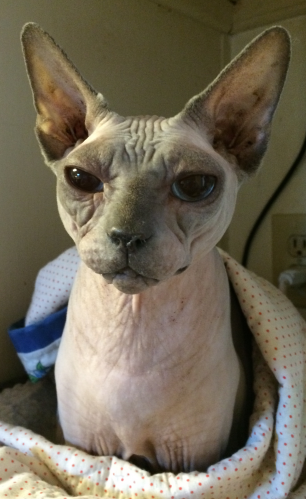 Cleo was 9 years old, had no teeth, had goop pouring constantly from her eyes and nose, and every time she ate she spray painted my walls with diarrhea (I apologize for the graphic mental picture, but I promise it really *was* that bad!). Lottie (10 years old) was in even worse shape. 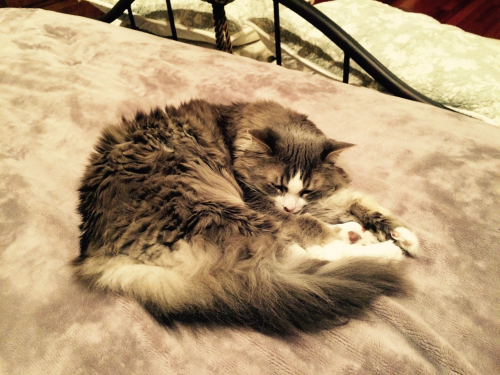 She was covered in pre-cancerous lesions and had 3 large open tumors on her side which she constantly licked, and she also had the chronic cold symptoms and diarrhea that her sister suffered from. Both girls were severely underweight and malnourished. 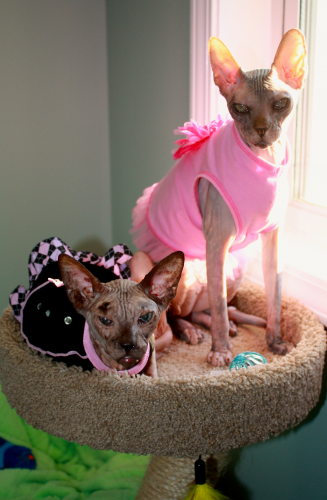 They were fed Purina seafood kibble in their previous home. Through a very long and slow process, I transitioned them first to cheap canned food, then high quality canned food, and finally to raw. The benefits were immediate. For the first time ever, there were formed stools in the boxes! The grannies have been treated for their colds and Lottie had surgery to remove her cancer (she's now cancer-free! ), and she is undergoing treatment for her precancerous lesions and I've been told she is more likely to die of old age than skin cancer, which is awesome news. Cleo and Lottie are both at a healthy weight, and the vet is very impressed at how healthy they are compared to how they were only a few short months ago. I attribute it to their raw food diet. Now they only need a forever home to complete their happy ending! Luke is the second dog/Golden Retriever I have been blessed to have as a companion. My first dog, Max was fed a kibble diet. Max passed away at age 9 from cancer. After his death, I went pretty much bonkers from grief and in my insane state, started really looking into feeding raw. I knew that if I was going to open my heart to another dog, I wanted to make sure I did everything right so that if my dog got sick, I wouldn't blame myself. We were blessed to find a wonderful breeder and on Dec 3, 2005 our Lucas was born. We celebrated his 10th birthday this past week. Luke is healthy and happy and energetic and I attribute this to his diet. Luke was originally on Bravo food, but once I found Hare-Today through Bonnie Day, I immediately switched over. 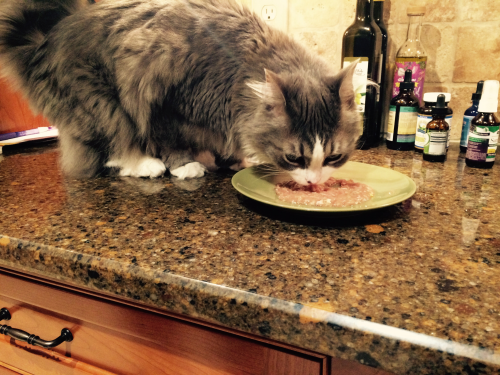 The food is so fresh (I buy ground meat/bone/organ meat), easy to handle and Luke loves it. Tracy is amazing to deal with, orders are always exact, packed and shipped perfectly and arrive with no fuss. It's all so simple and my Luke is one of the healthiest 10 year old Goldens I have every seen. It is the best feeling in the world to look at your aging dog and see a puppy with a little grey around the face. Feeding Raw from Hare Today has changed our lives!!!!! Our male cat "Biscuit" was on steroids and antibiotics NON-STOP for chronic diarrhea (vet diagnosed "Inflammatory Bowel Disease") .... I knew after a year or so of giving this medication to my cat that I HAD to find alternative answers on my own! I started to research and found Anne's AWESOME website www.catnutrtion.org and that's what led me to Hare Today!! That was YEARS AGO!!! Your cat when you feed them what they are SUPPOSED TO BE EATING!! My cat is a healthy boy now with a shiny coat and NO DIARRHEA since starting a ground raw meat diet!!!! THANK YOU HARE TODAY!!!! PLEASE don't ever go away!!!!!! P.S. 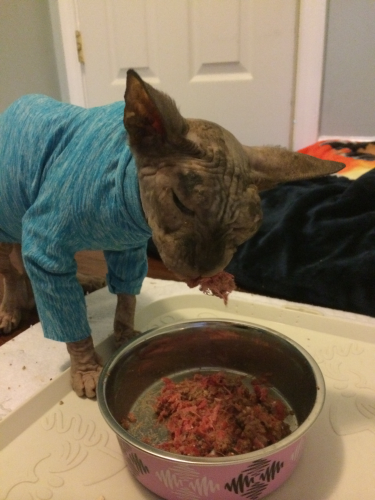 Please make sure you add the proper supplements to your cat's ground raw meat, raw bones, and raw organs recipe .... You CANNOT just feed your cat ground raw muscle meat only... THIS COULD KILL YOUR CAT!!!! I have ordered several times form Hare Today Gone Tomorrow. They have a great selection of hard to find items and the service is top notch! I tell people about this site all the time. Highly recommended! 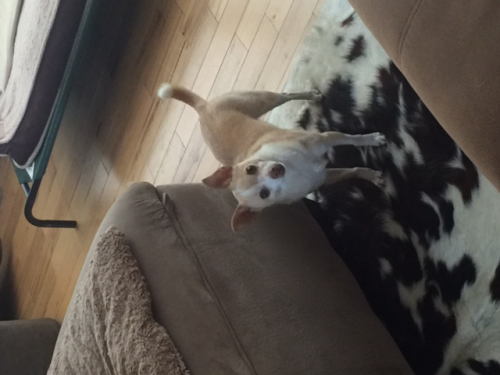 I have been feeding my 5 Chihuahuas raw food and raw bones for a few months now and they LOVE it! Their coats are shiny and soft and they are healthier than ever. 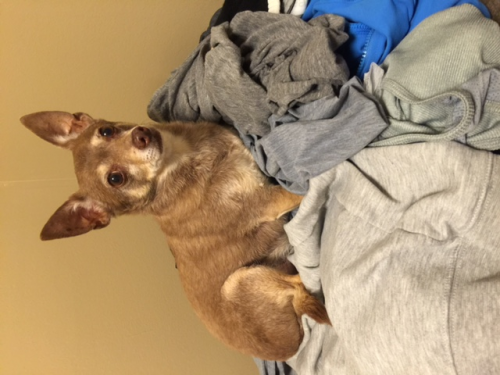 The changed in food happened because my dog was diagnosed with IMHA and a lot of changes had to happen and changing to a raw diet when he went into remission was one change. I don't regret it and wish I did this years ago but its never too late! Five Ridgebacks Can't Be Wrong! 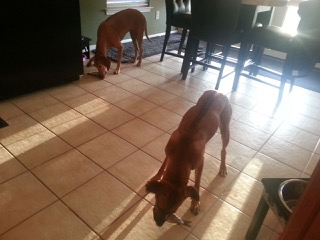 I started feeding raw several years ago to address allergy issues my senior Rhodesian Ridgeback suffered from. It was difficult to maintain due to lack of variety and inventory in my area, so I was delighted when a friend recommended Hare Today for our raw food needs. Problems solved and I have been a loyal customer since January, 2014! 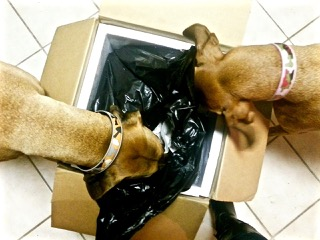 Three purebred and two RR mixes all agree Hare Today deliveries are like Christmas, and they can’t wait to help open the packages. The ground meat/organs/bone items work great in many of our food puzzles, and while I wish the fish could stay in the bowl while being eaten, it guarantees regular mopping of the kitchen floor! 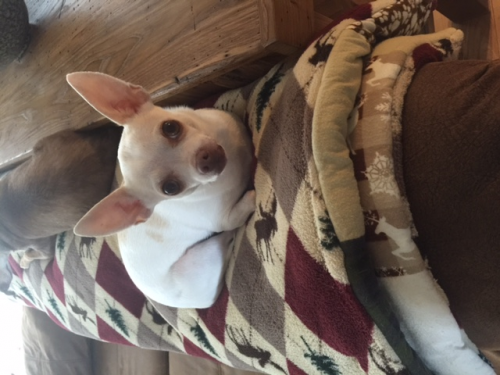 During vet visits, I am always complimented on the quality of coats, skin, clear ears and eyes, and outstanding overall health of each of my dogs. I can’t help but believe a quality raw diet has been instrumental to these great results! Outstanding customer service, great variety and a consistent level of high quality products will keep us coming back for more and recommending Hare Today to our family and friends! 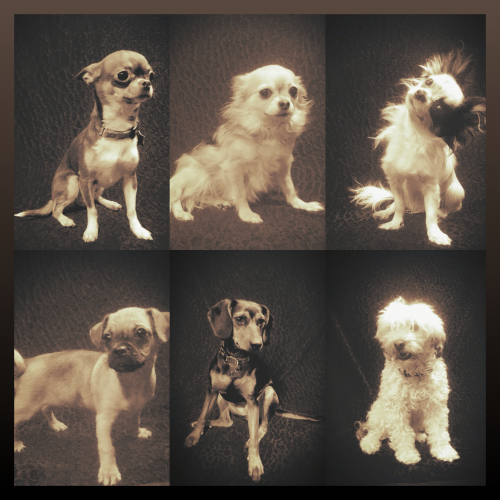 Trish, on behalf of Sasha, Royal, Axel, Layla and Zuko!